Not only is the Corvette America's favorite sports car, but it's also the longest-running model car in the nation's history! And no other automotive museum in the world is dedicated to a single model car. So it's no wonder that enthusiasts and visitors alike are entranced by the 115,000 square foot National Corvette Museum located just off I-65 in Bowling Green, Kentucky! 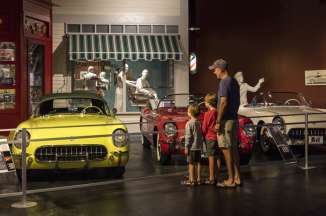 This top rated Kentucky attraction features over 70 Corvettes, most of which are on loan by private donors, that are showcased in periodic settings and include mint classics, prototypes, rare finds and racing champs. Families will enjoy the KidZone with hands-on activities for children, and the exhibit hall features rotating exhibits not always focused on the Corvette. Big kids love making their friends jealous when sharing photos of themselves in the "sitter" Corvette available in the lobby. Of course, you can make your friends really jealous by paying an additional fee to ride around the property in one of the museum-owned Corvettes or by having a full Corvette Experience at the adjacent Motorsports Park! New at the Museum in 2018... Take a virtual spin in a real C6 Corvette with the racing simulator! 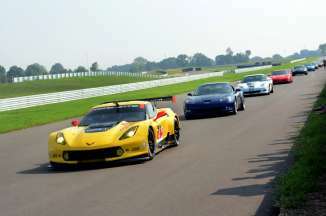 For a small fee, visitors can "drive" the modified Corvette with life-like movements surrounded by three video screens providing the racetrack's visuals. 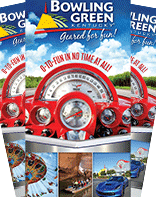 Trust us, it will get your adrenaline pumping and is worth the cost! Most visitors complete the self-guided tour of the museum in an hour or so. One highlight is certainly the interactive "Corvette Cave-In" exhibit that chronicles the sinkhole that opened up in the museum's Skydome swallowing eight Corvettes in 2014. The Corvette Cafe offers sandwiches, salads, and snacks if the crew gets hungry. If you're really serious about learning the history of Corvette, download the free audio tour online or via the Museum app. Open the full listing below for more details and links to the Museum's website and social media channels. Hours: Open 8am-5pm, 7-days a week year-round except New Year's Day, Easter, Thanksgiving, Christmas Eve, and Christmas Day.